The Karlskopf near Bachem is always worth a trip. The AhrSteig trail: Taking a break in the nature with a magnificent view. The high-calibre hiking trail in the north of Rhineland-Palatinate, known as Ahrsteig, crosses the Ahr Valley - also known as Germany‘s ‘Red Wine Dorado‘ - and the neighbouring Eifel region. Discover picturesque villages, rural meadow paths, some rock trails, breathtaking mountain plateaus, and working vineyards on beautiful hikes along the Ahrsteig trail. The Ahrsteig trail is characterised by impressive panoramic views of the romantic Ahr valley, far into the Eifel region, and beyond the plains of the Rhine River all the way to Cologne and its magnificent cathedral. The Ahrsteig trail measures around 110 kilometres in total. 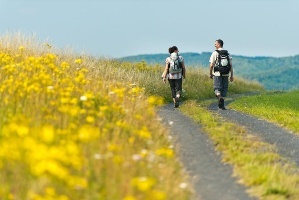 Overview: Accommodations providing hiker-friendly facilities & services at the Ahrsteig trail.